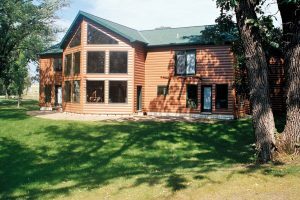 As you’re shopping for residential replacement siding, wouldn’t you like to find beautiful, long-lasting cladding for your home in Joplin, Missouri, that you would never have to replace again? That dream can become a reality when you choose ultra-strong, weather-resistant, seamless steel replacement siding from ABC Seamless Siding & Windows. We’re the siding installation experts who can wrap your home in beautiful steel siding that’s cut on site and precision-matched to the dimensions of your home so that there’s no need for unsightly, spliced-together panels that can detract from the appearance of your home. Unlike many other contractors in the area, we affix our siding to a home’s exterior walls with screws instead of nails so that it stays put, and we offer a five-year warranty on workmanship in addition to the product warranty. Our seamless steel siding comes in a variety of horizontal and vertical styles. We even offer a rustic faux log look that’s popular in this area. Unlike vinyl and wood siding, steel siding resists mold and mildew and rarely needs any maintenance. For more information about the last replacement siding you’ll ever need for your home in Joplin, MO, contact ABC Seamless Siding & Windows today.